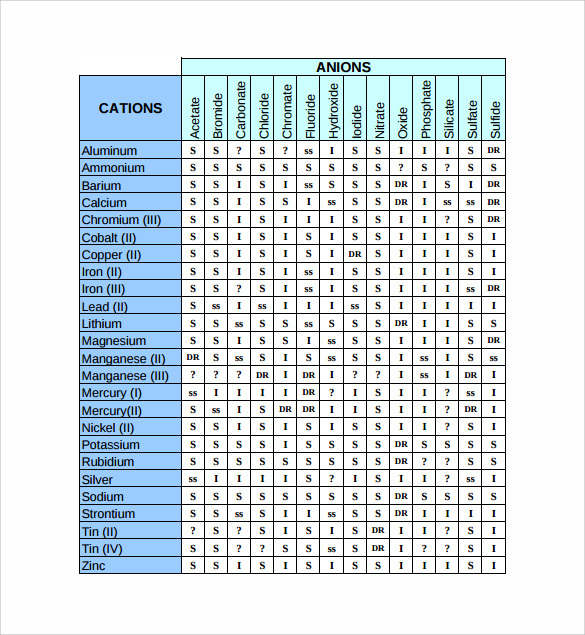 This Chart consists of the list of ions and explains how they are mixed with other ions. 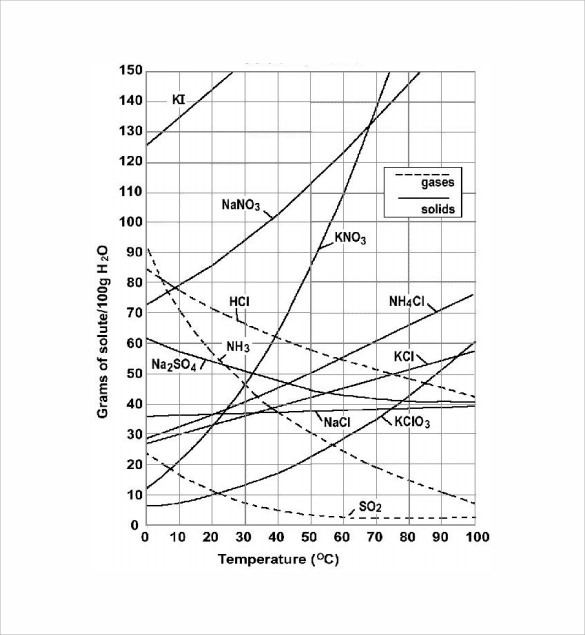 The chart displays solubility of different compounds with the pressure of 1 atm under specific room temperature. The solubility chart consist of chemical names like Chloride, Bromide, Iodide, Carbonate, Chlorate, Hydroxide, Nitrate, Lithium, Sodium, Potassium, Calcium and other elements. 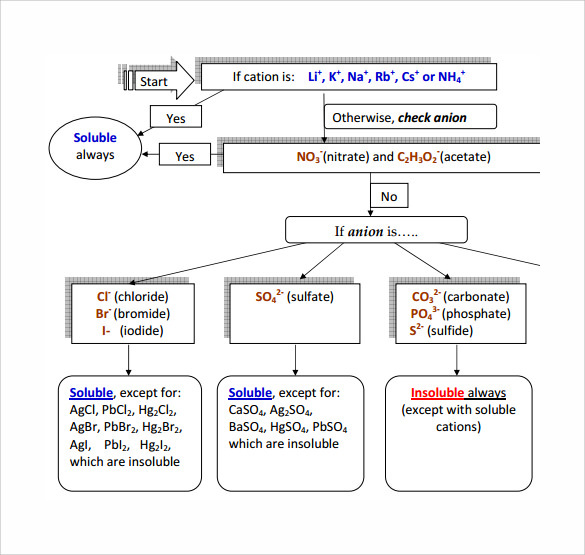 Used in chemistry subject, the Chart Templates contains of hard-core soluble and insoluble chemical formulas. 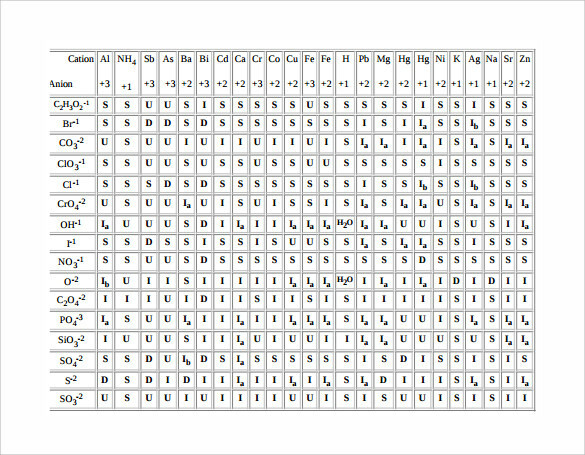 You can check out the solubility chart in PDF format to understand the chemical formulas. To add more, YouTube videos can also be helpful to get in-depth understanding of formulas. The ionic solubility chart template provides you with solubility of ionic compounds in water. Also, the key is featured for your help which explains what the abbreviations used in chart stands for so that you can easily read and understand the chart. 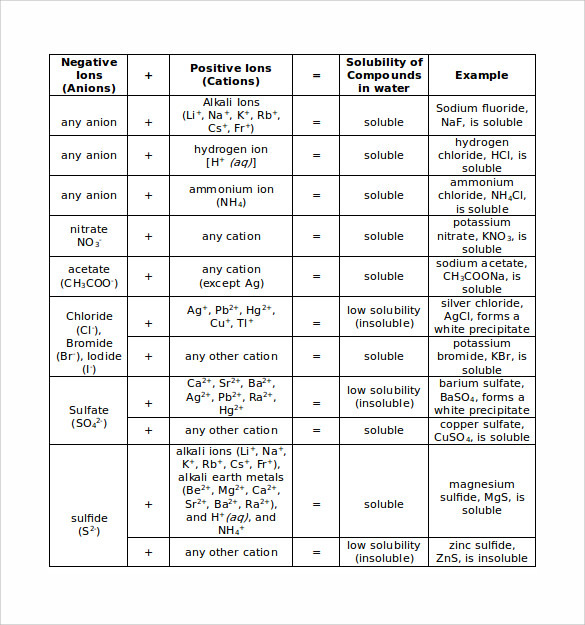 The solubility rules chart template features solubility chart which is well framed. All the contents in the chart are depicted clearly which while making it look presentable, also makes it understandable. With the help of this chart, it becomes to remember the rules as it acts as visual teaching aid. 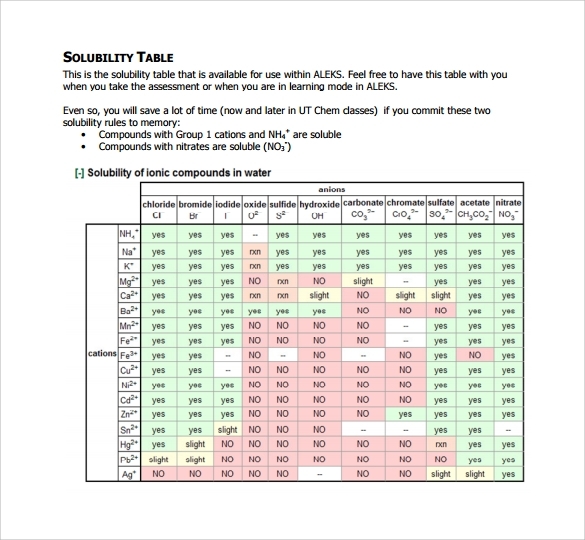 The printable solubility chart template features the solubility table which can be straight away printed and used. 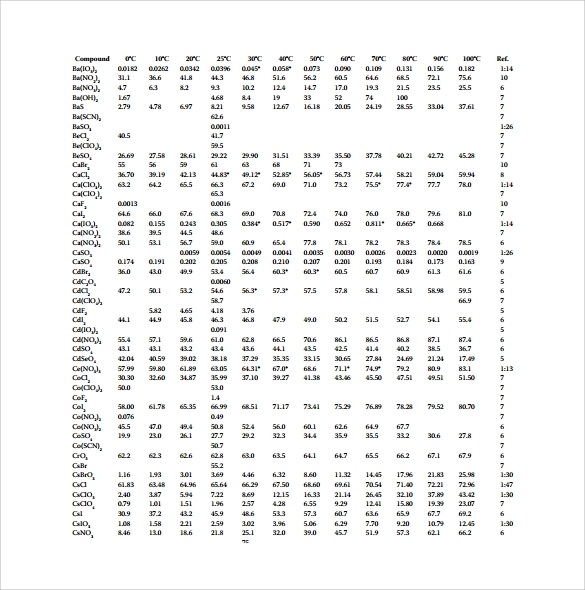 It depicts whether the compounds will be soluble or not by mentioning yes, no, slight, no data and rxn in the columns. 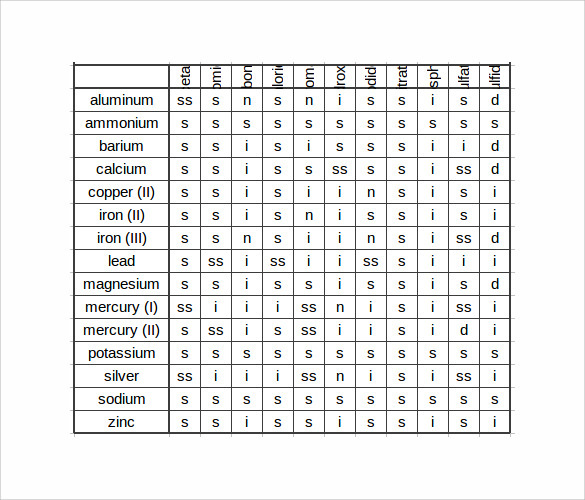 The solubility product chart template provides you with the chart depicting the products of solubility. This chart helps you in knowing as well as learning all these different products along with some of their examples so that it becomes more easy for you to understand it. Why is the Solubility Chart Template Needed? The solubility chart template is needed when in order to depict the solubility of different compounds when they are intermixed. These templates are needed so that you may easily get these charts which look presentable as well as provide you with correct knowledge so that it becomes easy for you to learn or to teach the solubility of compounds. It can also be needed as a visual teaching aid for students by teachers while they are teaching as the things see tend to last longer in our mind than the things we just listen. This template is also needed for minimising your efforts n preparing the chart all by your own.You can also see Chemistry Chart Templates. When is the Solubility Chart Template Needed? The solubility chart template is needed when you are teaching or learning about the solubility of compounds. This chart is usually needed when you are studying science, more specifically chemistry. It is needed when you need to know about what happens when a particular ion is mixed with another ion. With the help of this chart, it becomes really easy to remember the chemical names and their solubility with other ions. This chart helps in depicting all this information in a very organised manner and therefore, it also makes it clear and understandable. There are several benefits which we get after downloading the solubility chart template like it helps teachers in making the teaching learning process effective by used this chart as a visual teaching aid while teaching students about the solubility chart. It helps students in learning as well as remembering the chart by providing the information in such a manner which clear and definite. So, overall it helps in teaching and learning of the solubility chart. Also, this template helps in saving your efforts as you do not need to draw the whole table all by yourself and prepare the chart whereas you can simply download, print and use this chart straight away. These charts can also be used at home for self learning by pasting them on your study table, bulletin board or any such place which you see every day at number of times. 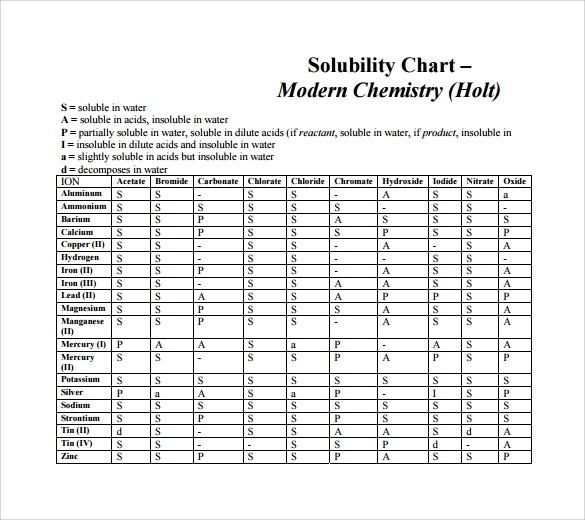 The solubility chart template is easily available on the internet and can be downloaded within no time. There are also various options available in solubility charts so that it becomes easy for you to find the best suitable one and download it. These charts help you in knowing and remembering the solubility of compounds easily.You can also see Process Chart Templates.